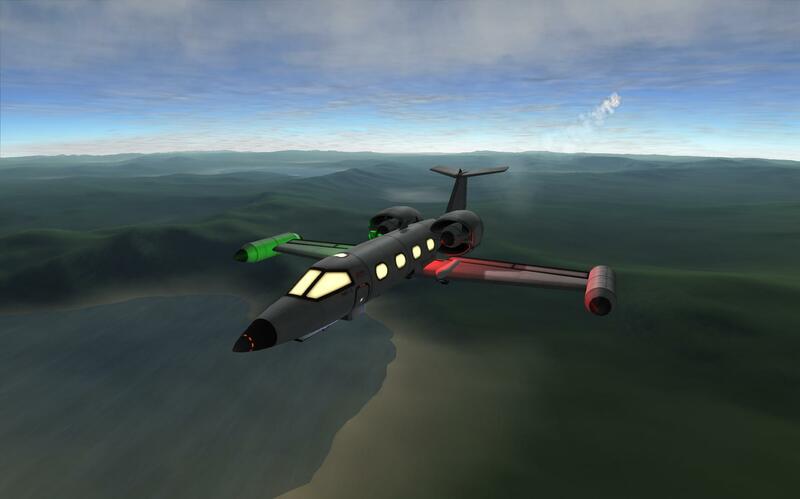 Based on the learjet design, this is a very easy plane to fly. 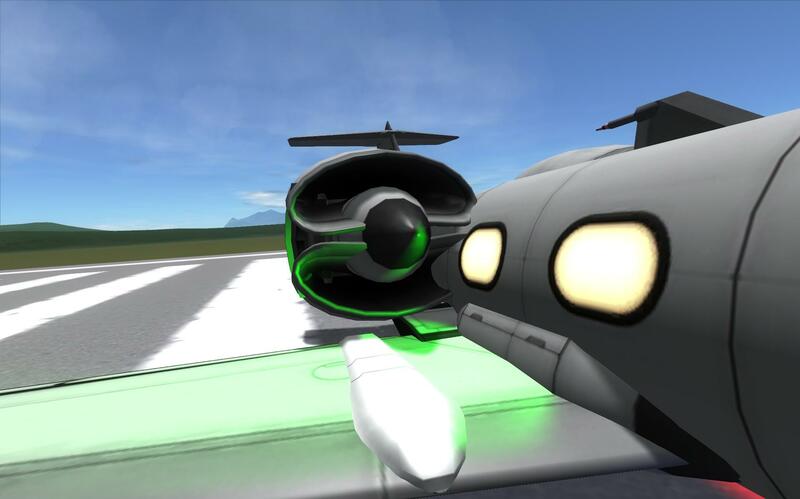 Flies well with physics warp and lands very realistically. 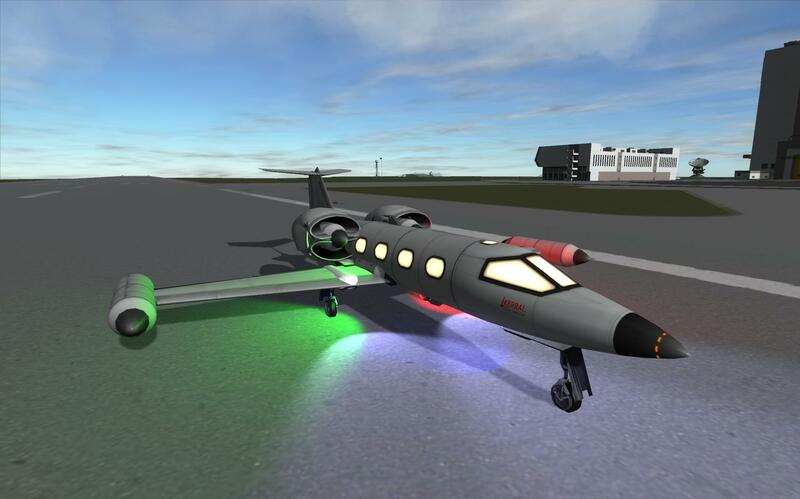 Unlike most other LearJet replicas this uses the larger engines, set in a rather unique way. 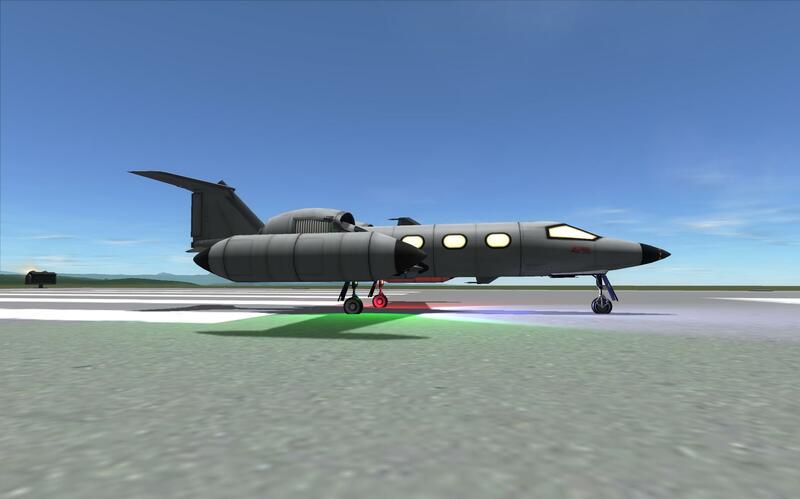 More power and has thrust reverse which is key to it’s landing process. 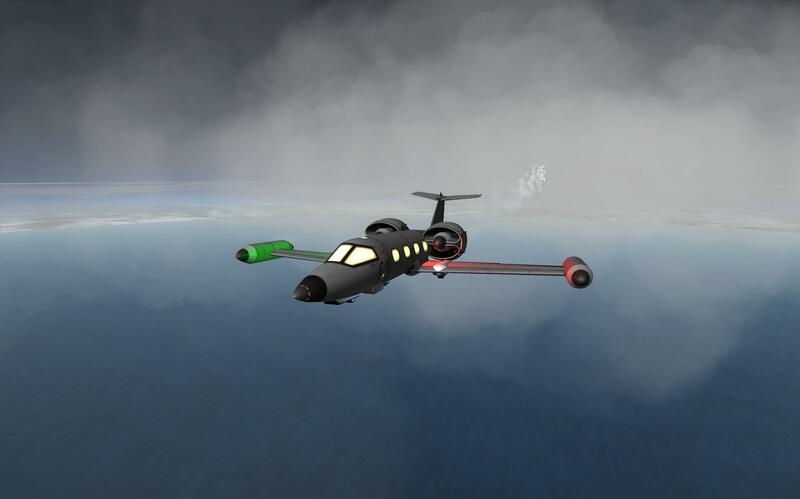 Flight is extremely stable at physics warp and it flies fairly well without SAS on, although I prefer using SAS. 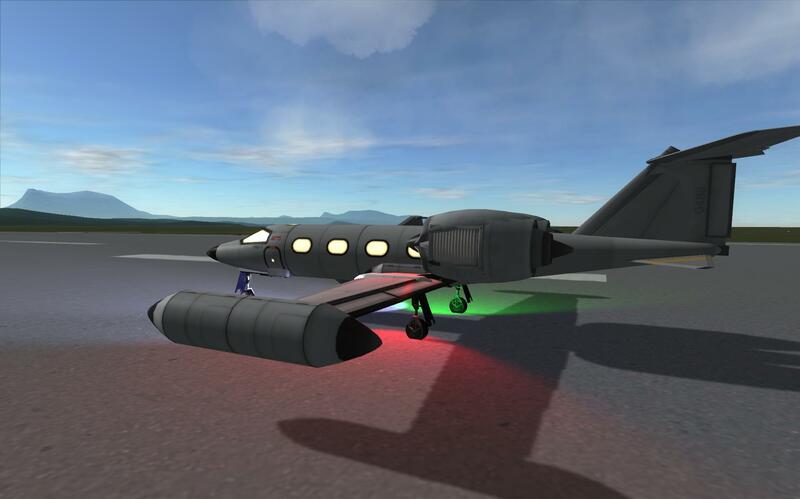 Unlike many of my aircraft designs this lands much more like a real aircraft, touching down on it’s rear wheels and remaining pitched up while it coasts down the runway before bringing the nose down (but for that to work you need to use the slightly odd flap setup). Throttle up full and release the brakes. When you reach 100m/s hit action group 3 which will pitch the tail down and pull the nose up. 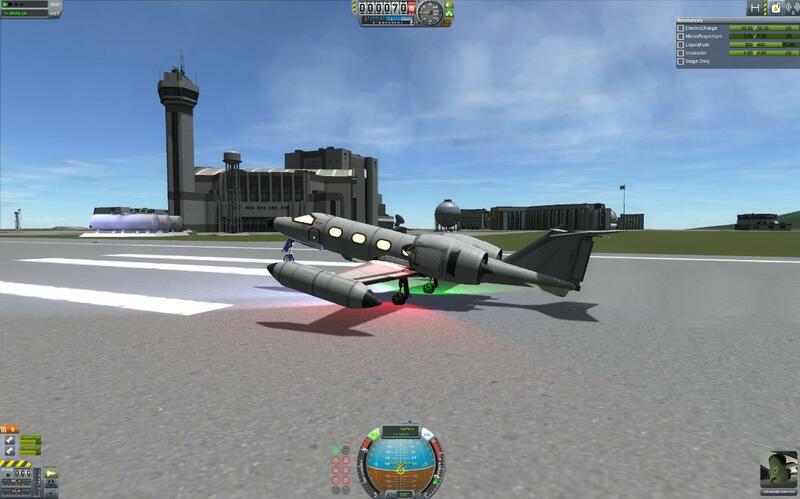 Then just let it lift off on it’s own (or for shorter take off pull up sooner). Once you clear the ground raise the wheels (which will also reset the small inner flaps) and then hit space which will reset all the other flaps. 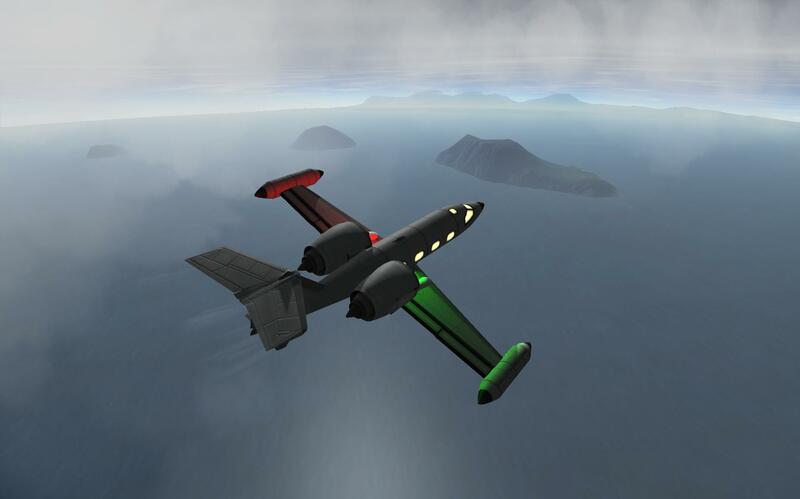 As you make your approach keep the craft level, reduce throttle to about half and hit space to deploy the main flaps. 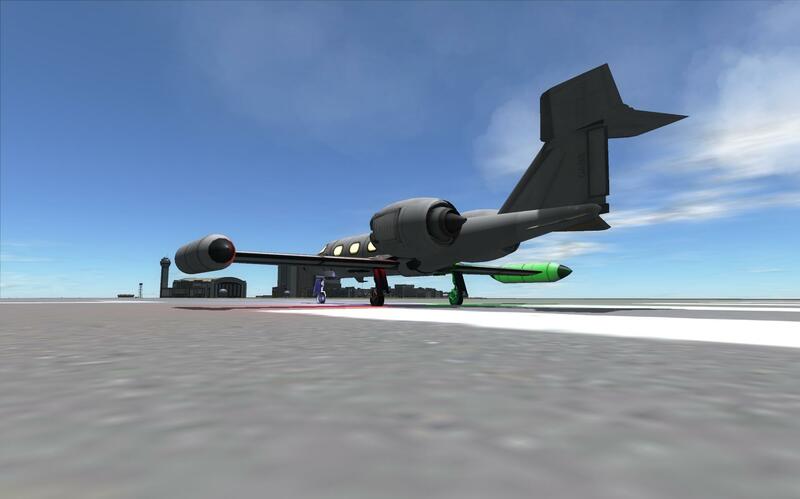 This starts pushing the plane down while maintaining level flight. When you lower the gears another set of small flaps will also deploy adding further downward force. You can then adjust the pitch and rate of descent with the tail (action group 3) and toggle that on and off as you descend. The aim of this design is to enable to craft to be in descent while still being pitched up so you can touch down on just the rear wheels. 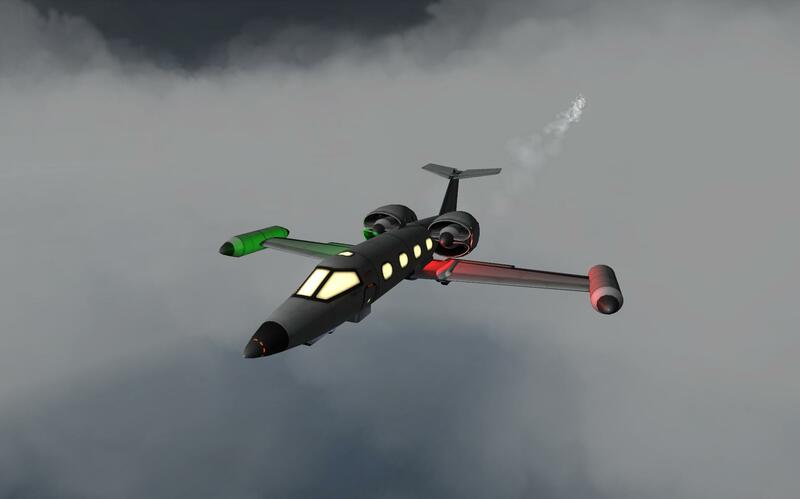 As the craft nears the runway all the flaps should be deployed (note space will toggle the main flaps, but only retracts the tail flap. use action group 3 to toggle tail flap). 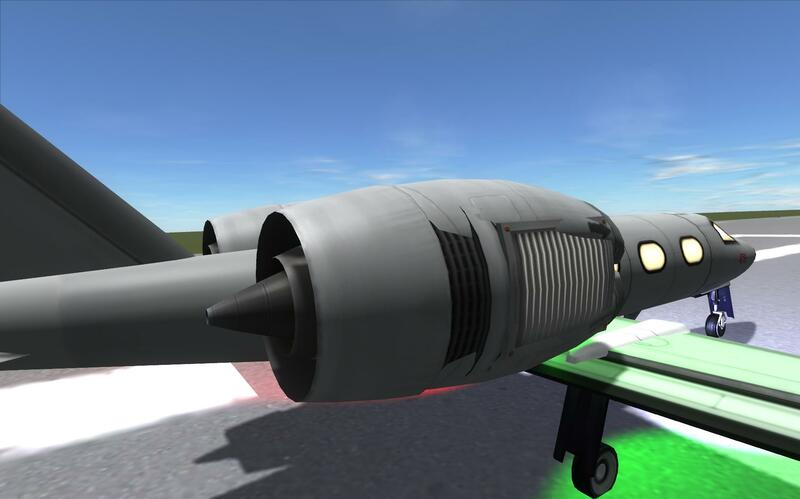 Just before touch down hit R (RCS toggles the reverse thrust on the engines) and ram the throttle to full (z). 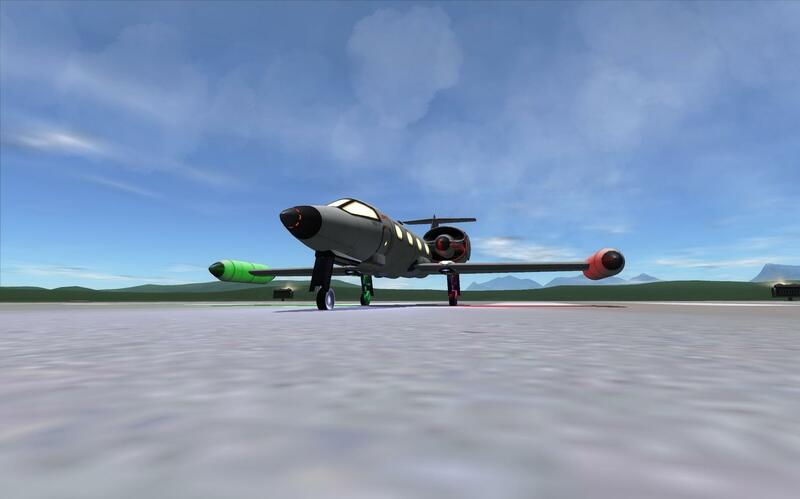 The plane should stay pitched up and will coast along on it’s rear wheels. 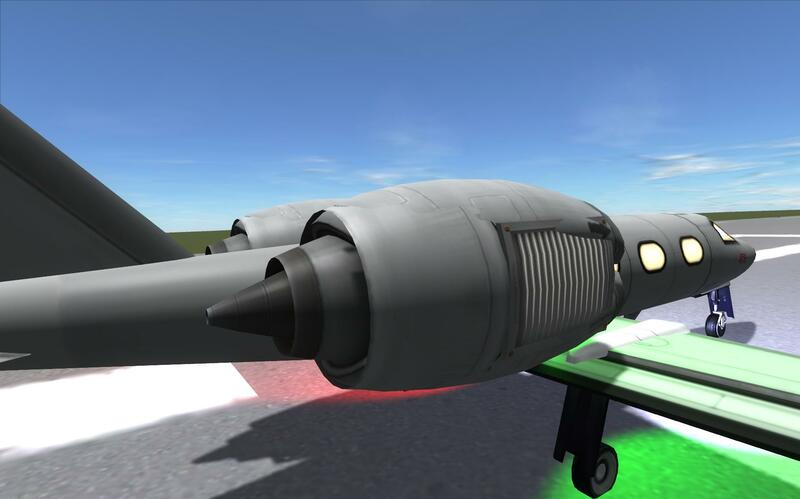 Apply the brakes, reduce the throttle and when the speed is low enough for just the brakes to handle hit R & X to disable reverse thrust and cut the engines. Then hit space to reset the flaps. 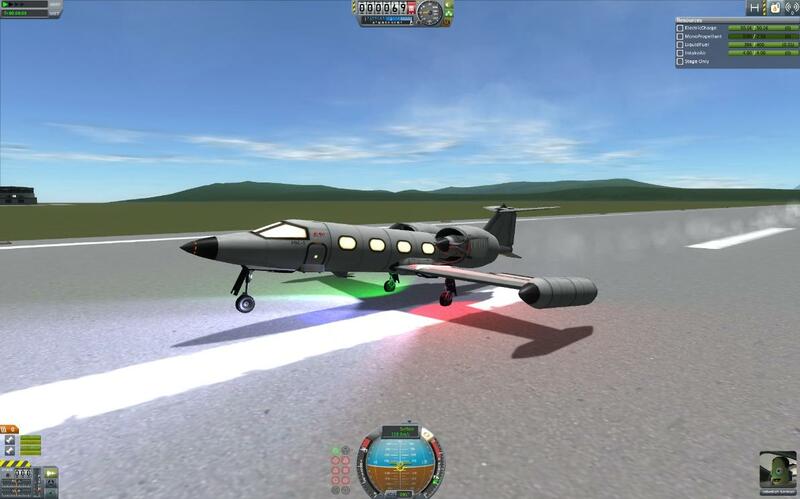 It should look (and sound) much more like a real landing!! 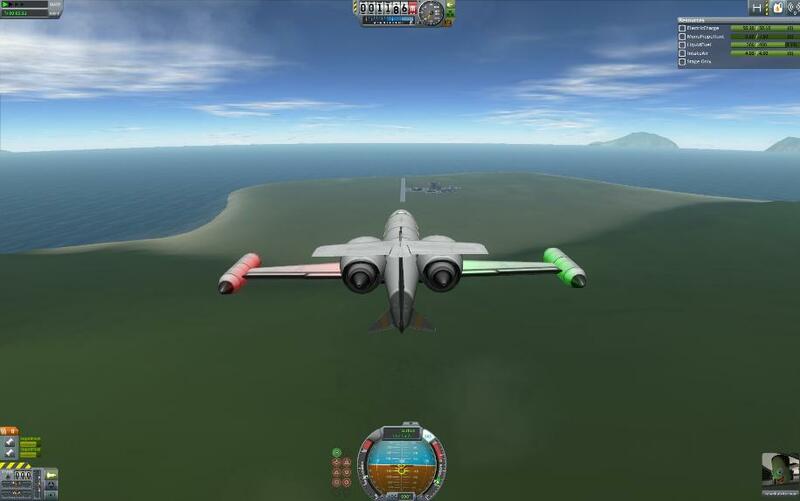 If you want a really smooth completely hands free take off then invert the deploy angle of the 3 sets of flaps on the main wing. Then hit ZTU-Space and release brakes. The craft will lift of very gently and remain level during take off. This would actually be the more conventional setup for the flaps, increasing lift and drag. 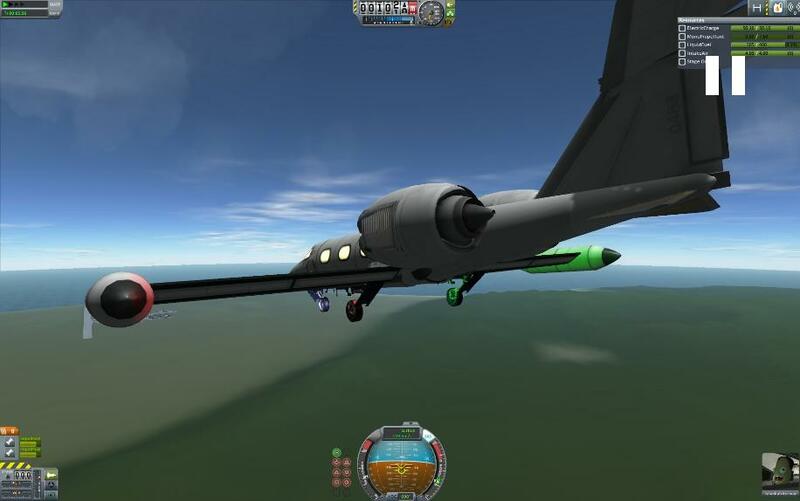 But a KSP craft like this has so much lift anyway, adding that extra lift makes landing very much harder (although that would be how it would land in RL).